Job listing & posting has moved to Connect2Careers through Career Services! 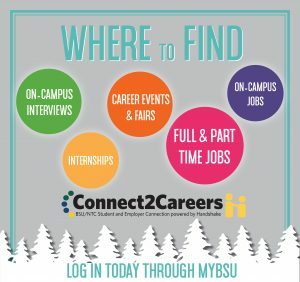 Find your next job, internship or on-campus employment using BSU’s Connect2Careers program that allows you to explore positions from over 200K employers. Discover full & part-time jobs, internship opportunities, career fairs & events and on-campus events. *Please note this is only job postings. All other student employment items have not changed.